Wade Foster is the CEO and a co-founder of Zapier, an app that has revolutionized thousands of workflows for professionals. As the “easiest place to sync data between web apps,” Zapier has found a place across all kinds of industries. Zapier was founded in 2011 when Wade and his cofounders saw need and demand across the web app technology space for automating workflows, APIs, and connecting apps and services together. Zapier is a member of S12 batch of Y Combinator. Currently, Zapier features integrations with 800 different technologies and counting. Very frequently there is already tremendous demand for a product, and all that’s missing is the relevant messaging and value propositions, as well as the product itself. In many cases, the best and most popular products and brands in B2C and B2B industries are already engaged in harvesting the hungry available demand. In the initial growth stages of a product, there are always going to be certain metrics that are not worth pursuing or paying attention to, possibly because the data doesn’t even exist. Having one central KPI in the beginning phases of a product’s growth can help maintain the focus required to generate the data for exploring other KPIs in the future. Although focusing on your long-term growth strategy is important, some marketers will lose site of what is happening right now. Focusing on your next immediate action needed to address an immediate need with a long term goal in mind can dramatically help clarify your marketing priorities. Ander: I’ve mentioned this before when I’ve done these interviews for Advertising Influencers where we’ve talked to a number of marketing thought-leaders, CEOs, VCs, and a number of other talented individuals from some pretty successful companies here in the Bay area and beyond. But, once again, it’s really cool talking to the architects behind these platforms that I am a huge fan of personally, and that I use every day, along with many of my coworkers at Instapage. And that is exactly who I am speaking to right now – Wade Foster, one of the co-founders and CEO of Zapier. And from what I hear Wade, Zapier makes you happier. Wade: Zapier makes you happier. Ander: Wade, it’s a pleasure to meet you. It is a pleasure to be on this call with you and thank you so much for taking the time to join us. Wade: Yeah, I’m excited to be here. Ander: Let’s start with what Zapier is. And, for anybody who might not be aware of it, listen closely because this is a tool you’re probably going to want to use. Wade: Yeah. It’s an automation platform and it hooks into about 800 different common apps that you might use. A thing that you might do with Zapier and Instapage is set up a zap that takes anyone that fills out your form and sends the info into Salesforce or MailChimp or Campaign Monitor or Airtable or a spreadsheet or anything like that. It makes it easy to push data from one app to another. You can build point to point but you can also do full-blown workflows as well. You could do more complex things like someone fills out Instapage, run it through FullContact or Clearbit and enhance the data and then send it to Salesforce if they match certain credentials. You can also make them more sophisticated as well. It spans from basic integrations to full-blown workflows. Ander: I almost see it as a more powerful IFTTT for business. Wade: Yeah, it’s definitely a similar philosophy. We definitely target the business use case, really trying to automate a lot of this back office chores that, you know, happen in pretty much every business. Ander: Yeah, absolutely. And you guys have been around for a few years now. Wade: Yeah, 2011 was our start date. Late 2011. Ander: You’ve grown to millions of users at this point. In fact, I can pretty confidently say that in my own marketing network, I can’t think of any individuals who have not or do not use Zapier right now or at some point. You guys have grown substantially. Wade: Yeah, it’s been a fun couple of years trying to add new apps to Zapier and reach out to new audiences and get the tool in people’s hands, make them more efficient and effective. Ander: So, how did you do that? How did you get this tool into so many people’s hands? And maybe the way we can start with that is hearing what your growth or marketing philosophy was at the beginning when you started. Wade: Sure. We knew that people already wanted integrations, right? Integrations was the thing when Zapier started. I remember going to basecamp.com and you could go to their ‘extras’ page and see cool little ways that you could find little add-ons for Basecamp that made Basecamp extra good. The fact that people were already searching for integrations and proactively seeking out solutions for us, the marketing piece didn’t have to be as novel. It was like people are already looking for this stuff. It’s just not provided very well. Wade: It’s very difficult for SaaS vendors to build all the integrations that people want. So, if we could find a novel way to build it, we could probably get the distribution into folk’s hands. I really looked at the initial parts of Zapier as demand harvesting more than demand generation. Ander: Demand harvesting… That’s a great phrase. Wade: Yeah. You know, this demand is already existing, it’s already in the market. So, we just have to tap into it, right? So in the early, early, early, early days for Zapier–we totally don’t do this anymore–but we would go to forums. I remember going to the Highrise forums and people were asking for years for a Google contacts integration. I just posted a note in there and said, ‘Hey,’ you know, ‘if you want this you can use the APIs to build this. Also, we’re working on a project over at Zapier that might be able to let you do this yourself.’ Drop a link in for how to contact me. Ander: That’s a 50% conversion rate. Wade: Yeah, the conversion rates were huge! Right? Which makes sense because these are people who have already taken the initiative to post a thing on a forum that says, ‘I want this.’ Most people don’t have that activation energy to do that unless they’re really interested in something. Ander: Yeah, and what you were able to do in that situation is provide a very personalized solution for a personalized need that somebody had. Wade: Yeah, exactly. It was almost like the equivalent of people walking up to a customer service desk and saying, ‘Hey, I’m here at Walmart. At Walmart, where do you have the butter?’ And you’re like, ‘Oh, that’s on Aisle 5. You can just go get it,’ right? Ander: Haha. That’s a great example. Wade: Yeah, it was like we saying, ‘Hey, we provide this thing,’ to people that were already looking for this thing. Wade: The marketing behind Zapier was just getting us into the channels that people were already proactively searching for this stuff. Let’s talk a little bit about ‘demand harvesting.’ It’s a very interesting idea. I’ve never really heard that before quite in this context. What kinds of products, or what kinds of markets or personas, are conducive to that demand harvesting? Or is it something that we could perhaps apply to anything we’re marketing? Wade: I think most products and services can actually take this approach. There are very few products that exist that are completely novel where you have to go entirely re-educate a market about a new solution or new way to provide a new solution to something, right? Wade: Most products aren’t like that. They’re an iterative advancement on something that kind of already exists. You think about search marketing. Search marketing is entirely demand harvesting because you’re taking keywords that people are already searching for and you’re trying to get your pages to rank well for certain keywords so that your solution to this problem is front and center for folks. Wade: I think most marketing actually falls under this and I think a lot of marketers when they look at their solutions get a little too lofty with it. Instead they just need to think of the concrete ways that people are already searching for products and services that they can provide. Ander: Do you think that marketers, in general, are making things too complicated by looking for these very niche hacky ways to get somebody into their funnel? Wade: Certainly I think a lot of start-up marketers are, for sure. When you’re early days you basically have two problems. Number one… Does my product actually do the thing that I say it can do? And two, can I get in front of enough people that we can make a business out of this? A lot of stuff just doesn’t matter in the early days. A/B testing just doesn’t matter because you don’t have enough traffic to even run sufficient A/B tests. Wade: Really sophisticated email marketing flows in the early days just don’t matter because there are not that many people going through your email list. There’s just so much of that stuff that just doesn’t matter. When really it’s like, ‘Hey, I just need to find ten people.’ That’s what you need. You’ve got to figure out how do I do that. It could be as simple as running some Google ads or it could be as simple as actually doing Google searches for people who might need this stuff and just cold emailing them asking, ‘Hey, do you need this stuff?’ How do you go about searching for solutions to this sort of problem? Try to tap into the existing channels where people are already searching for things. Ander: So from that point of view, with what you’re doing right now at Zapier, do you find that most of your acquisition is coming from from someone who’s looking to do something with a specific service or a specific app? Or are people looking for, in some ways, a one-stop shop data hub? What do you find is more effective for you guys? Wade: It’s definitely more of the former, though that’s becoming less and less common just as we grow. Wade: We’re starting to tap into a bigger market that is less aware of this problem. And this is kind of crossing the chasm spiel, right? Wade: It’s like, alright, now you’ve got to go find and reach a bigger market. But, definitely in the early days and even still today, there’s so many people that we could reach out to that have this problem that just aren’t searching for Zapier in places where Zapier exists. Like, our marketing isn’t going in those channels where people are already looking for these solutions. Ander: On that note, let’s take actually a step back to even before Zapier even started. What was the inspiration for starting this company? Wade: So Brian and I – Brian’s one of my co-founders – were working on some side projects and would occasionally get asked to build integrations like this. Get Paypal sales into QuickBooks for me or get this list of leads into SalesForce, that sort of stuff. And Brian messaged me on iChat one day and he was like, ‘You know, we should just build a tool where people don’t have to hire us. We’re expensive. We could build an out-of-the-box solution where non-engineers who don’t have any clue what an API is can just sign up and get what they need.’ And I read that and was like, ‘Yeah, that is a great idea. We should work on something like that.’ That was basically it. Ander: One thing led to another and here you are with millions of marketers and other technical professionals – even people who aren’t that technical – using Zapier to do all sorts of amazing things. You guys obviously work with a lot of different SaaS products, and lots of different companies have what I imagine are nice relationships with you guys as we have here at Instapage. There was this article that I actually read about what is in your SaaS stack and what Zapier uses. It goes into that subject quite in-depth. When you are a marketer, when you are navigating all the different tools that are available, there’s maybe 4,000 different MarTech products out there right now, or something like that. It’s incredible to me how some of them are still able to break through the noise. So, when you’re choosing your stack, how do you actually evaluate which product is right for your need? Is there a process or a framework that you recommend? Wade: Oh, boy. That’s a big, tough question. Wade: Haha. You know, I like to approach this problem from the bottom up. What do I need to solve right now? Am I trying to run a campaign where I need to send an email to a person? And, if so, do I just need to send a one-off triggered email? Do I need a transactional email provider or am I trying to send bulk emails to a list? For me, it’s trying to assess what are the functions that you actually need are. Then from there, it usually narrows into a handful of two, three, four that you could potentially use. Ander: Yeah, that’s a great answer. Wade: Keep it pretty simple, right? Ander: Yeah, that certainly makes a lot of sense. There’s been a lot of talk recently – in fact, our CEO Tyson wrote about this in a blog post – about best in breed tools versus a one size fits all or a full-stack solution. Something like HubSpot might be that all-inclusive solution. They offer post-click landing pages, they offer email, etc. Here at Instapage, we’re focused on making post-click landing pages as powerful and as great as they can possibly be. Now, Zapier’s obviously a way to connect all of these best in breed solutions together, if that’s something that you’d like to do with your approach. How do you think this is going to change moving forward across the marketing landscape as a whole? Wade: I definitely think this is more and more common. It’s easier than ever for a solo dev to build a product, right? They can spin up a thing on Heroku and have a basic app running in a couple of days. And so it’s so cheap and so effective for them to do that that’s why we see this proliferation of martech tools. And the end user often doesn’t need this full suite of tools. They often need one thing really, really good, right? They need a post-click landing page software so they can get leads. They just need it to be really simple and really easy and really fast for them to be able to use. I think you’re going to see more and more tools that are really good at one thing and just really knock it out of the park with that one thing. And then, they connect into other apps that are really good at one thing. I still think there will be products that break out into suites and stuff like that. The HubSpots of the world aren’t going away. They’re fantastic products because if you are needing something more robust and something that can span across an organization, those are still valid ways to solve those problems. Ander: Especially if you’re a solopreneur or a small business owner as well. Now, there are lots of things you can Zapier for. The list is pretty much endless at this point. Wade: Yeah, we’re coming up on 800 apps now. Yeah. Ander: That’s about what I figured it was. What are some of the applications that you’ve seen and applications that you anticipate to see with Zapier and advertising or top-of-funnel acquisition? Wade: I think one thing that I think is really exciting is things like Facebook lead ads. Being able to put an ad form right inside your Facebook page instead of having to go through a middle step, sending them to a separate page, you can convert people right on-site. It’ll be interesting to see if other advertising platforms take a similar path to that with being able to put forms right in the page and push folks there. I think that’s pretty interesting. And, being able to pull in extra data that you get from platforms like Facebook and stuff like that is pretty interesting as well because the targeting and stuff you can do there is pretty deep and specific. I think that’ll just become more and more common no matter where you’re running ads. Ander: Or even with marketing in general… Where do you think that it’s going? What do you think it’s going to look like in the future?? Wade: I think there’s still a lot more we can do with underlying data. The tools are getting better but they’re still not amazing at tying into your existing data sources and making it easy to run campaigns based on stuff you already know about people. How many of us are running campaigns that are less efficient than they could be? It’s like, ‘Yeah, I have this data. It’s in this other silo. I could probably use it to target better, to segment better, but I can’t really get great access to it.’ So we run a campaign that’s maybe a little more inefficient than it could be. I think there’s still a lot of innovation that can happen there. Ander: And in this innovation that can happen, what’s in store for the future of Zapier? What do you see happening with you guys in the future as the landscape changes and as you guys continue to grow? What do we have to look forward to? 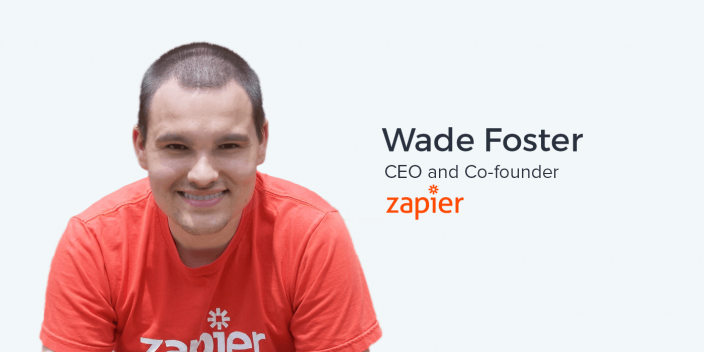 Wade: One of the things that’s pretty exciting for us as we’ve been able to grow is that we’re able to get more applications on Zapier, which is always a good thing. But we’re also able to deepen our relationship with existing partners. So we’re able to build up functionality alongside of them and get access to new and different APIs that allow for things that didn’t exist before. In the early days of Zapier, we were totally banking onto pre-existing APIs. It was like, ‘This is what’s supported, so this is what we’re providing.’ But as we’ve been able to grow, we’ve been able to say, ‘Hey, there’s actually gaps in the market. There’s inefficiencies here where this service provider… If you add this to your API, you’re going to see a lot of value being created.’ I think that’s a pretty exciting. As we’ve been able to grow we’ve be able to spot areas where we can kind of make things a little easier for folks, whether it’s in marketing or even in other industries as well, too. Ander: What are some of the most surprising industries that you see engaging with Zapier? Wade: We have people from all walks of life. We’ve got marketers, e-commerce, lawyers, accountants, you name it. But probably the one that surprised me the most was an integration with this massive multi-player online role-playing game called EVE Online. Wade: Yeah. So this wasn’t something we built. We have a developer platform where others can build on it. EVE Online I guess has this big, almost real-life economy as part of it and the guy was making money – real dollars that you can go to the grocery store and spend – through EVE Online. Wade: And so for him, it was super valuable to be able to hook EVE Online up to these other tools to get notifications and alerts and things like that about stuff that was happening in the game because it made him a better game player and he was able to generate more real-life dollars based on this stuff. So he built this thing in Zapier and it actually has a decent amount of usage. Wade: That was probably the most surprising thing. We’re targeting the tools you would expect, right? Your email marketing providers, your CRM providers, your project management providers. And here out of left field we get this massive multi-player online role-playing game. Ander: I can only imagine some of the awesome and funny things that you see and incredibly powerful things that your customer success teams are seeing as people are using the product. Wade: Yeah, we get crazy stuff all day, every day. I think another one of my favorites… We had a guy build something based on two services – one is called KanyeText and the other is called SeinfeldText. Wade: And you can basically pay him like, I don’t know, one buck, five bucks, or ten bucks. Depending on how much you pay him, that’s how many texts he’ll allow you to send to your friend that are either Kanye quotes or Seinfeld quotes. Ander: Wow. You know, I feel like I saw this on Reddit or something. Wade: Yeah. The guy is super smart. I think it was on Reddit and trending for a while. Anyway, it’s entirely powered by Zapier. You pay through Stripe and you give them a phone number, and then, Zapier sends all these text messages to your friend. So if you have a buddy that is really into Seinfeld, you can use SeinfeldText to text him a whole bunch of Seinfeld quotes every day. Haha. Ander: In other words, you can use Zapier for pretty much anything that you need to do with connecting different products together. Ander: Awesome. Well Wade, we’re just about out of time. I imagine you have a busy schedule. I know that we certainly do here at Instapage. But I want to ask you Wade, what is something that all of us listening, all of the marketers out there listening to this podcast, Advertising Influencers, what is something that you’d like them to check out? What’s something that you think that they should pay attention to? Ander: If somebody listening works for a marketing technology company or any technology company for that matter, and they would like to be in your massive catalog of different apps, how can they do that? Wade: Yes. Definitely go to zapier.com/developer and this shows you how you can add your apps to Zapier. That’s definitely something to check out. And then the other thing to check out is all the other apps that are integrated with Zapier too. If you go to zapier.com/zapbook, you’ll see a list of about 800 apps and there’s probably tools in there that you didn’t know you needed. And so you can find stuff that will help you solve problems in your day-to-day business there. Ander: And that’s why Zapier makes you happier. Ander: Alright Wade, well it has been a pleasure connecting on this call. Thank you so much for taking the time to do this and we will talk to you soon. Wade: Alright, thanks for having me.